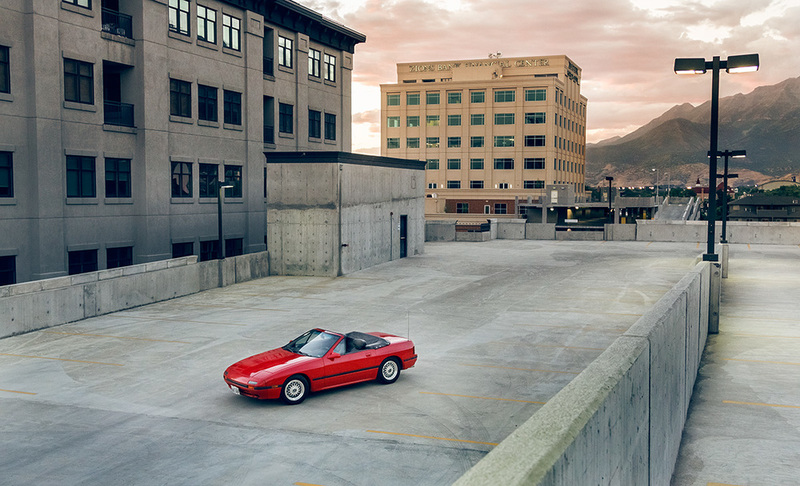 I got a phone call not too long ago from a dear friend, requesting my help in photographing his beloved 1987 Mazda RX-7 in preparation for his selling of said vehicle. He put a lot of time, effort, and money into making this car his, and has decided to sell it; but he didn't want just plain photos of it, and (as stated) he asked for my help in getting some images that really show how awesome this car is and how much he cares for it. I accepted the challenge, having never really done any automotive photography work before, and was excited at the possibility of photographing something new. Truth be told, I haven't done a lot this summer (photography wise) and was anxious to do something. So, I thought about what might be cool, talked it over a bit with my buddy, and we set out. We initially took it up a canyon, tried some shots with the car moving, and then found a place to park it to try some stationary shots. The light was nice and even, which worked well for many of the detail shots that he needed, but the main exterior images weren't as pleasing. I thought about it, and decided that I wasn't as happy with the location as I thought I might be. This is a vehicle from 1987. It has sharp lines, sits low to the ground, and just feels like it belongs in the future. I felt that a city backdrop might suit it better and recommended to my friend that we take it back to Provo, and go to one of the parking structures there to have another go at it. The Wells Fargo parking garage is my personal favorite in Provo, so that's where we headed. We took it almost to the top, put it at a nice angle that was still a bit below me, and starting shooting as the light began to fade. We tried a few different places in the garage, a got some images that I was really excited to work on. We finished up and then I spent some time over the next couple of days working on them. I really enjoy post-production work, and especially tweaking color in an image. Color can change the mood and feel of an image. Even while I'm creating a photo, I already have in my mind what I will do with it in post-production. Alright....that was a lot of words. TL;DR: Cars are a new type of work for me and I love working with color in post-production. Onto the photos! The RX-7 chilling under the lights in the garage. Parked in the open air. I love the wide open feel of this image. My personal favorite from this series. I really love how the light is just kissing the clouds with a little color. Kissing is always good.